The Lowry Beer Garden is located at 7577 E. Academy Blvd, Denver. For information, visit www.lowrybeergarden.com. Tucked under the wing of an authentic B52 bomber, outside the entrance to the Wings Over the Rockies Air Museum, is The Lowry Beer Garden. It is as if they plucked this beer garden right out of Europe, and transported it to our wonderful city of Denver. Family fun is served up every night at the Lowry Beer Garden. This outdoor garden is a wonderful place to enjoy with your family, share some great food, and meet your neighbors. It has all of the charm of a European garden with Oktoberfest-style picnic tables, shady trees, and twinkly white lights. For the sports enthusiast, there are three flat screen TVs, but better yet, there are ping pong tables to show off your athletic talents. For the less aggressive attendees, there are countless board games and playing cards to entertain you. 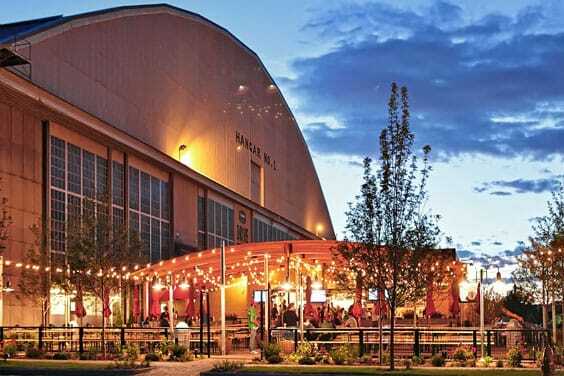 The Lowry Beer Garden fosters a community atmosphere where people can come together and socialize, while enjoying 16 beers on tap that showcase Colorado craft beers, and European brews. The garden also sports a full bar with wine, beer and cocktails. For the food lovers, the selection of casual fare is outstanding. Inspired by acclaimed Chef Troy Guard, the quick-serve menu style perpetuates the authentic beer garden feel. "Build it yourself" German bratwurst and sausage, salads, burgers, wings, and sweet potato fries, are just a few of the many treats to enjoy. My family's favorites are the fried pickles with ranch dipping sauce and the German pretzel. The Lowry Beer Garden celebrates all the best things you think of, when you think of Colorado – the outdoors, casual lifestyle, incredible weather, craft beer, and fresh local products. Manager Christian Mohaupt sums it up best saying, "At a normal restaurant, you are at a table that's an island, but here it is about people coming together as a community, and getting to know your neighbors." And with more than 4,500 sq. ft. of outdoor garden fun, the Lowry Beer Garden is sure to be a hit this summer!